CricketTalk: Can England square Test series with India? | How are Andrew Gale’s 2017 preparations going? ENGLAND head into the fourth Test against India with only a very slim hope of saving the five-match series. 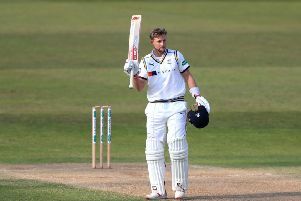 Alastair Cook’s men have suffered heavy defeats in the last two encounters and have been further hit by the blow of losing young opener Haseeb Hameed to injury, with Durham’s Keaton Jennings likely to step in and partner the captain at the top of the order. Yorkshire’s Adil Rashid has excelled with the ball for England and is the leading wicket-taker in the series so far with 18, so England will be hoping he can continue his promising form in Mumbai from Thursday onwards. Cricket writer Chris Waters joins host Phil Harrison to discuss England’s chances of squaring the series, as well as looking at the relationship between captain Cook and head coach, Trevor Bayliss, which has come under the spotlight more in recent days, with the Australian talking of taking more of a lead role in the changing room. We also discuss Andrew Gale’s first few weeks in charge as Yorkshire first-team coach and how he has settled into his new role since being chosen to succeed Jason Gillespie.